Lovely charm for a February baby: a round disc with an applied enamel flower in the center. Applied letters spell out "FEBRUARY" and "VIOLET." 14K yellow gold. 3/4" in diameter. 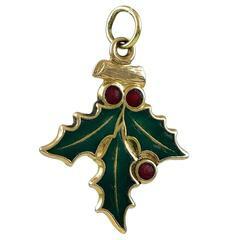 Alice Kwartler has sold the finest antique gold and enamel jewelry and silver for over forty years. This item can be returned within 2 days of delivery.